A Creve Coeur police officer was forced to use his Taser to subdue a fleeing suspect Friday. Officers were called to Thornton’s Oil shortly after 2:00 a.m. A cab driver claimed a fare was refusing to pay a $22.00 fee. Officers soon placed 40-year-old Jesse Hardin into custody after a check revealed an active Peoria County warrant for traffic offenses. A subsequent search of the cab’s back seat uncovered approximately one-point-five grams of suspected methamphetamine. Creve Coeur Police Chief Dale King says officers soon found Hardin yelling and bleeding in the rear of the squad car. The Peoria man was taken to a Pekin hospital for treatment. He escaped officers while awaiting discharge. 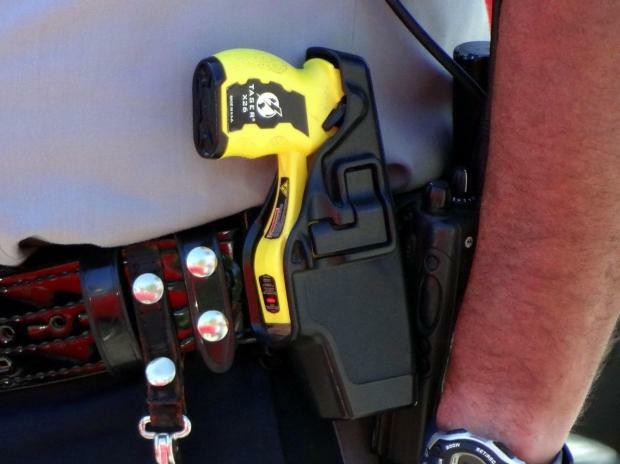 An officer fired his Taser while pursuing Hardin. Hardin was struck in the lower back, taken into custody and transported to the Tazewell County Jail. Police Chief King has not released the names of the officers involved in this incident. Jesse Hardin is facing charges for resisting a police officer, escape, possession of methamphetamine and possession of drug paraphernalia in addition to the Peoria County warrant.